Jordan Brand is obviously looking to make a splash later this year with their impressive lineup of Air Jordan 9 Retro shoes. 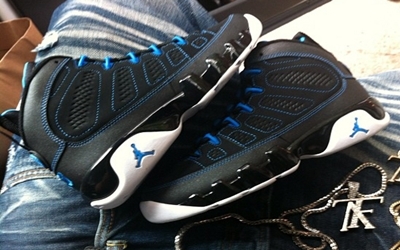 Aside from the “Johnny Kilroy”, “Olive”, and “Cool Grey”, the Air Jordan 9 is slated for release in Black/Photo Blue-White colorway, which is simply known as the “Photo Blue” edition of the kick. The silhouette, which features a black upper accented with photo blue linings, laces, and Jumpman branding, will be hitting shelves on November 3 – two weeks before the release of the “Olive” edition. This one looks very promising so make sure to include this on your must-buy on November!